An MP in France's governing party has been charged over a violent clash that left a rival Socialist politician in hospital. 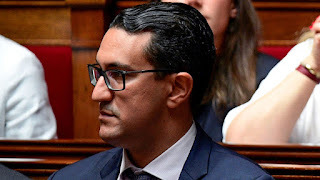 M'jid El Guerrab was accused of twice striking Boris Faure with his motorbike helmet during the altercation at a bar in Paris on Wednesday. Mr Faure had to have emergency surgery and spent five days recovering in intensive care following the fracas, local media reported. The outburst came after a long history of conflict between the two men, following Mr El Guerrab's defection from the Socialists to En Marche! - French President Emmanuel Macron's party. Both accuse each other of being the aggressor, but one source close to the case claimed Mr Faure called his opponent a "dirty Arab". Mr El Guerrab is his party's MP for French nationals living in North and West Africa. He has since announced a leave of absence from En Marche! and said through his lawyer that he regrets "succumbing to the provocation". Mr El Guerrab has also been subject to judicial controls, including a ban on contacting Mr Faure. The injured politician's family said it was outraged by allegations of racism, commenting: "We will undertake all legal steps to re-establish Mr Faure as the victim."